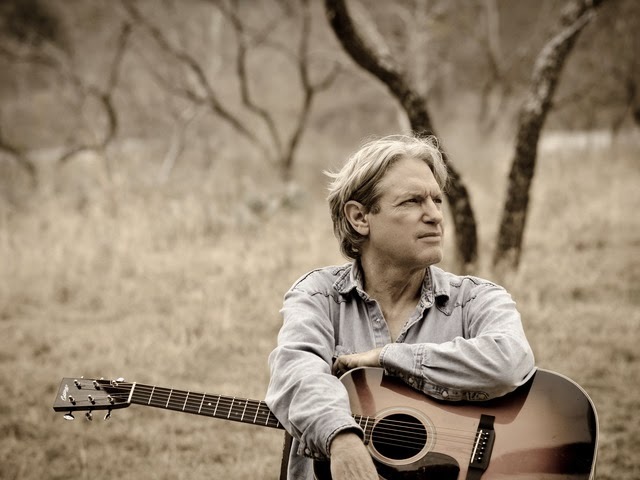 If you want a modern singer-songwriter to personify the famous 1940s song ‘Deep in the Heart of Texas’, then you need to look no further than the mesmeric poetic anecdotes of Sam Baker. In some respect the vocals and music are mere accomplices as Sam is very much a wordsmith able to deliver his thoughts with an alluring appeal. Once again the guys from Hot Burrito Promotions did a tremendous job in rallying close on 100 people from near and far to Elford Village Hall in the Staffordshire countryside. Although when you’re promoting an artist as good and popular as Sam Baker then you’ve got a pretty good head start. Sam was making a return to this rural venue, although for the first time since SAY GRACE was released last summer. However he gauged the knowledgeable audience well and successfully carried out an all request second set to what was a near 2 hour show. 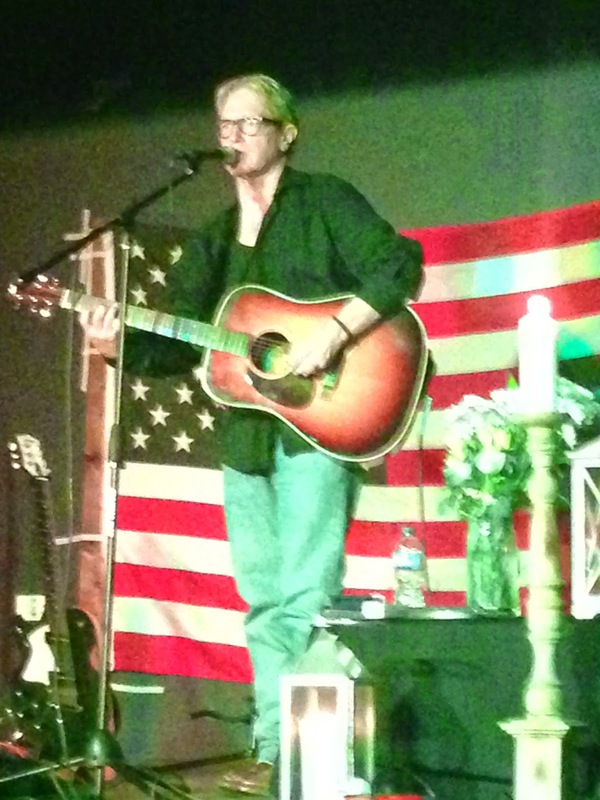 As you would expect from an experienced Texan troubadour the songs were interspersed with relaxed humorous audience banter and the stories behind some of the songs. Whether or not you had seen Sam live before, keen fans would have heard or read about his incident in Peru many years ago and true to form the track ‘Broken Fingers’ followed the heart breaking tale of the people he met and lost on that fatal train trip in South America. While you can reel off a multitude of contemporary artists operating out of Texas in the same vein as Sam such as Robert Earl Keen, Tom Russell, Slaid Cleaves and Ray Wylie Hubbard, it is probably James McMurtry who is most alike in sound. Sam made reference to a couple of his heroes in the set by revealing how ‘Migrants’ had a similar theme to the Woody Guthrie song ‘Deportees’. Also he chose to open the evening with a version of a 1994 Johnny Cash track ‘Drive On’ but this is where the covers ended as Sam has so much rich original material from his four albums that have surfaced since he got his break as a recording artist in 2004. Sam gave a nod to Bob Harris, who has championed so many Texan/Americana artists in the last decade, but like so many inspirational song writers he doesn’t forget his roots and in particular his days working in construction as highlighted in ‘Ditch’. Over the course of the evening, which received stand up rapturous applause at the end, Sam featured songs from all his albums but particularly focussing on MERCY, PRETTY WORLD and SAY GRACE. The highlight from the first set was ‘Slots’ as Sam took a little time to get into his rhythm. The second set saw Sam get right into the groove as he reeled off requested song after song with notable performances being of ‘Baseball’, ‘Say Grace’, ‘Signs’ and ‘Angels'. Obviously a travelling troubadour eventually has to say farewell to their temporary home and Sam had the perfect sign off track in ‘Go in Peace’. No doubt many in the audience will keep their fingers crossed for a return in the future but Sam is the sort of artist who attracts individual fans to more than one of his shows. Texas has long been a fertile ground for singer-songwriter talent and Sam Baker does his home state proud. For a brief couple of hours on this Saturday evening, Elford was well and truly transported to ‘Deep in the Heart of Texas’.